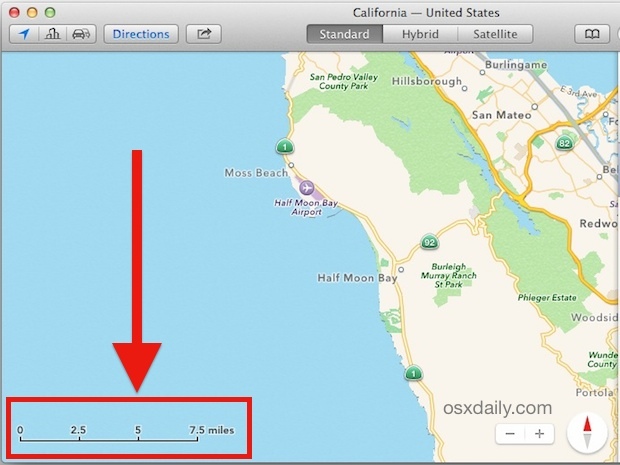 The Maps app in Mac OS X is a useful tool to pre-plan routes, generate map files for offline usage, send directions to an iPhone, and much more, but one critical cartographic component that’s missing by default from all Maps views is any sort of scale indicator, making it difficult to get an idea of how far one thing is from another. 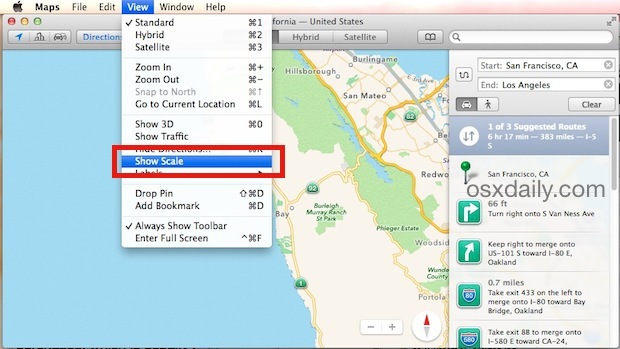 But not to worry, the Maps app in Mac OS has Scale as an option, you just have to toggle it on for the scale (in feet and miles, or meters and kilometers) to be visible. You’ll notice the scale adjusts automatically and on the fly as imagery is adjusted, whether the location has been changed, or the active map has been zoomed in or zoomed out. It also appears regardless of viewing in Standard, Hybrid, or Satellite view, and whether showing directions between locations for any variation of travel, or just a general map. This is useful enough that it should probably be turned on by default, but fortunately it’s easy to switch on. The scale indicator also shows up if you print the map or save a map location as a PDF, which is handy if you’re expecting to be out of cell range or if you’re using the maps as part of a geography lesson. Do note that if you’re sharing a location with someone else, you might want to tell them to turn on the scale viewer as well, otherwise it won’t show up by default. Just about…useless. Can’t move/rotate it, nor is there any other way to measure in maps. Yes, I understand that the underlying data might not be fully rectified, but still. Sure you can get distances along roads for walking or driving, but ‘as the crow flies’ sure would be helpful for those of in land planning. On the other hand, those maps CAN be exported into another app where measurements can be made.